As we enter the new year, it's time for everyone to come out of the woodwork and make their predictions for 2011. In the past two weeks, there's been a cacophony of expert opinions predicting higher oil prices this coming year. JPMorgan Chase and Bank of America Merrill Lynch both predict $100/bbl oil. The ex-CEO of Shell predicts $5 gasoline. These predictions are backed up on Wall Street with oil futures recently shifting from contango to backwardation - signaling tight physical supplies of oil. Many experts are stating that we've passed the peak of world oil production at least two years ago and that 2011 could become a repeat of 2008 for oil prices as we trudge through the "Bumpy Plateau". If the US economy maintains its brisk recovery in 2011 and the Chinese economy continues to increase its oil consumption at a record pace, the quickly-rising demand for oil will run straight into the wall of peak oil production in 2011, causing the price of oil to spike well above $100/bbl, and leading to a demand-destruction-induced double-dip recession. The world economy can handle slow, steady increases in the price of oil, but fast spikes in the price of oil can have devastating consequences on the economy. As I mentioned in my demand destruction post, there's a possibility that this post-peak-oil enviornment will lead to a series of oil price spikes followed by market crashes. 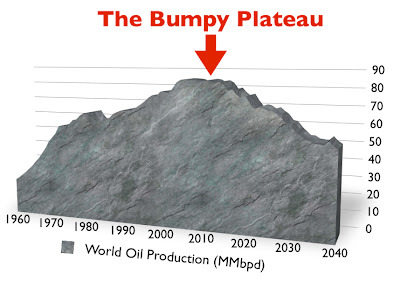 As these spikes and crashes hit, the world oil production swings along with the price of oil, masking the true worldwide oil peak - this is referred to as the "Bumpy Plateau". As an investor, you should be looking to protect yourself and profit from these oil price spikes and market crashes during the bumpy plateau period. Step 1: Hold the Peak Oil Proof Portfolio now. Step 2: "Sell High": As the oil shock "alarm bells" go off, short the market, sell your holdings, put the proceeds into crash-resistant holdings. Step 3: "Buy Low": Use limit orders to buy the Peak Oil Proof Portfolio and high growth stocks at their lows following the market crash. The Peak Oil Proof Portfolio is designed to diversify your holdings across asset classes, industries and countries that are best positioned to profit from a post-peak-oil world. The Peak Oil Proof Portfolio has been beating the S&P500 for the past few months, showing the strength of these holdings. This portfolio will allow you to profit from the current market and will limit the damage to your portfolio of a market crash should you fail to get the timing right. Step 2: "Sell High": As the oil shock "alarm bells" go off, short the market, sell your holdings, and put the proceeds into crash-resistant holdings. This is the difficult step, as it requires you to keep an eye on the market and to move quickly when an oil spike occurs. One way to look out for a oil price spike is to analyze the current price as a ratio of the S&P500 to Oil. In a price spike, this ratio typically goes "out of whack" as the price of oil moves much faster than the market. As I mentioned in the demand destruction post, if the S&P500/Oil ratio goes below 12, the oil price spike is nearing the limit that the market can handle, which usually leads to a market crash. Using a ratio of 12 is conservative, and it won't maximize your profits. In the last two oil shocks the ratio actually dipped below 10 for a few days - so a more aggressive ratio (such as 10) can be used to try to maximize your profits if you're willing to take a bigger risk and keep an eye on the ratio minute-to-minute. If you look at most recent oil shocks, you can see that the price peaks were signaled by sharp changes the price of oil right before the price spike caused a market crash. Starting in 2003, oil prices steadily rose from an average of $30/bbl to a top of $147/bbl in 2008. In the early summer of 2008, the price of oil spiked and the S&P500/Oil ratio dropped below 10. Shortly after this signal in mid-July, the oil hit an all time high of $147/bbl, the market crashed in October and the world entered the "Great Recession". By the end of the year, oil prices had fallen down to $30/bbl - back to a 15-20 S&P500/Oil ratio. In 1990, you could have shorted an oil ETF (if they had existed) at a price of $35/bbl (when the S&P500/Oil ratio dropped below 10) and then bought the ETF 3 months later at $20/bbl to cover your short, for a return of 75%. Similarly, in 2008, you could have shorted an oil ETF at a price of $125/bbl (when the S&P500/Oil ratio dropped below 10) and then bought the ETF 6 months later at $30/bbl to cover your short, for a return of over 300%. In much the same way that you should use limit orders to cover your short positions as the market crashes, you should use limit orders to buy stocks at discount prices. Of course these limit prices are just an example and you'll need to adjust the prices and quantities based on how much you want to invest, how how far you think the market will crash and what balance you want to strike between buying low and risking not being able to buy at all. This should be repeated for all of the ETFs in the Peak Oil Proof Portfolio. With oil prices low from demand destruction, these high growth stocks could easily out-perform the Peak Oil Proof Portfolio as investors pile back in to stocks once the market begins to recover again. These high growth stocks can be held until oil prices begin to climb again, at which point they can be sold and the proceeds can be invested into the Peak Oil Proof Portfolio, which, due to its commodity-heavy holdings, should outperform the market as oil prices reach their highs again.